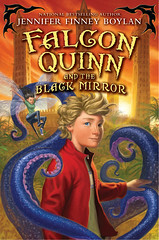 Send a question to Quimby@falconquinn.com. From time to time, Quimby will respond, and both questions and answers will be posted here. How come the vampires in Falcon Quinn can walk around during the daytime? I hope this isn’t like one of those things in “Twilight,” where vampires sparkle in the sunlight. Because that has kind of ruined sparkling things for me for ever. — P.H., Chagrin Falls, Ohio. The Magnificent Quimby thanks you for your question, P.H., and notes that he once visited his friend Doug Kenney, co-founder of the National Lampoon in Chagrin Falls. 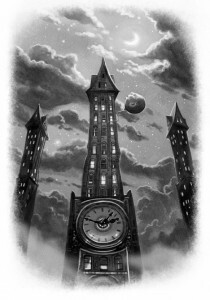 The issue of vampires-in-the-daytime, according to author Boylan–a most peculiar woman, if you ask me–is addressed somewhat in Falcon Quinn & the Crimson Vapor, the second book in the FQ series. She did note that all of the young monsters in Falcon Quinn are not yet in possession of their full monstrous powers–which won’t completely take effect until they graduate the Academy in good standing. As for the adults–I believe there is a most annoying vampire-teacher named Count Manson, who plays a large role in Falcon Quinn II— Boylan (again, a distasteful woman whom I am reluctant to quote) claims they wear something called SVF 1000, a kind of sun-screen for vampires that enables them to walk in the daylight without transforming into disgusting little piles of lint. Awful creatures, vampires, if you ask me. But very useful if you need someone to open a can. Quimby sends his best wishes to you and all residents of the aptly-named town of Chagrin Falls. Dear. T.W. As I told those annoying children at the time, people always think they want their fortunes told, but they never do; whenever I tell fortunes, I always wind up in trouble. Still, I will do my best for you. Young T.W., say what you want. Is always the idiot, never the savant. See? I told you you wouldn’t like it.